While it’s easy to identify a Pileated Woodpecker (think Woody Woodpecker) or a Yellow-bellied Sapsucker, two smaller and very common woodpeckers provide a challenge to even more experienced birders. So… how to tell the Downy and Hairy Woodpeckers apart? 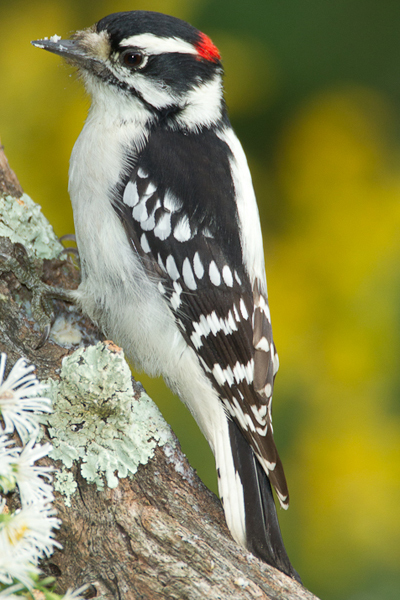 The little Downy Woodpecker (pictured here) is around 6.5 inches long, and looks like a smaller version of “The Classic Woodpecker.” Look closely at the beak, though. Does it look a little small for the rest of the body? Watch the behavior, as this might be the easiest way to identify a Downy woodpecker. Because of their small size, Downies can venture onto much smaller branches, twigs and even plant galls than the larger Hairy woodpecker. If you ever see a small acrobatic woodpecker, it’s probably a Downy. Visually, Hairy Woodpeckers are almost identical, although a couple of inches larger than the Downies. But this size difference makes all the difference in their behavior, as Hairy Woodpeckers are just a bit too heavy to risk thinner branches and so are found on main branches and tree trunks. While they overlap in habitat, and either species can be found in a woodlot, yard, or city park, Hairies tend to stick to more mature forest habitats, and are seen less frequently on the edges of habitats. Many people think that being able to tell the difference between Downy and Hairy Woodpeckers is one of the first indicators that they have graduated from novice birder to expert. So grab your binoculars, and head out to ID some woodpeckers! These tips should help you make the Downy/Hairy ID’s quickly and accurately!